The Embraer Phenom 100 is a Very Light Jet from aircraft manufacturer Embraer. Sun Airlines finds the Embraer Phenom 100 to be one of the best in it’s class. The Embraer Phenom 100 can seat 6 to 7 people, including one pilot. The Embraer Phenom 100’s interior is designed by BMW DesignWorks USA. The Embraer Phenom 100 is powered by two Pratt & Whitney Canada PW617F-E turbofan engines with 1695 lbf (pound-force) of thrust from each engine. The Embraer Phenom 100’s engine is apart of the PW600 series engines designed for the Very Light Jet Class. The avionics system on-board the Embraer Phenom 100 is called the Prodigy Flight Deck 100 a system developed jointly by Garmin and Embraer. The Prodigy Flight Deck 100 avionics system is the Garmin G1000 with an integrated maintenance computer. The Embraer Phenom 100 has an IFR Range* of 1178 nautical miles (1,356 statute miles). The Embraer Phenom 100’s overall great performance and design has made it one of the best in its class. Embraer is now building Embraer Phenom 100s in Melbourne, FL. 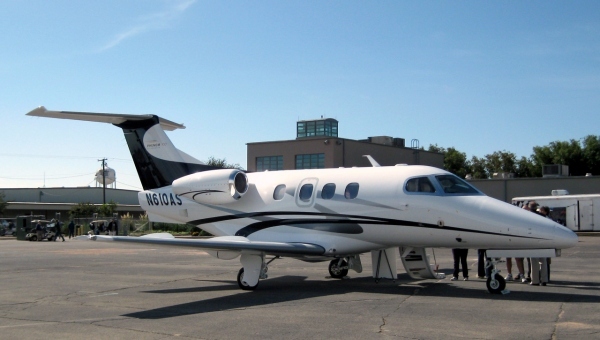 Previously the Phenom 100 was built at Embraer's production facility in San Paolo, Brazil. The Embraer Phenom 100 is designated as the E50P and the EMB-500 by the FAA (Federal Aviation Administaration) and ICAO. Embraer Phenom 100 Type Rating : Learn about the Embraer Phenom 100 Type rating and how to obtain one. Embraer Phenom 100 Price - Details on the price of a new or used Embraer Phenom 100 jet. Embraer Phenom 100 for Sale - Find out information on Phenom 100s for Sale in the aircraft marketplace. Sun Airlines will provide updated information on the Embraer Phenom 100 when it becomes available. Embraer Phenom 100 Specifications: You can see more detailed Embraer Phenom 100 Specifications and Dimensions on our Embraer Phenom 100 Specifications and Dimensions page. - Data from Embraer, Pratt & Whitney Canada, and Garmin.